So good. 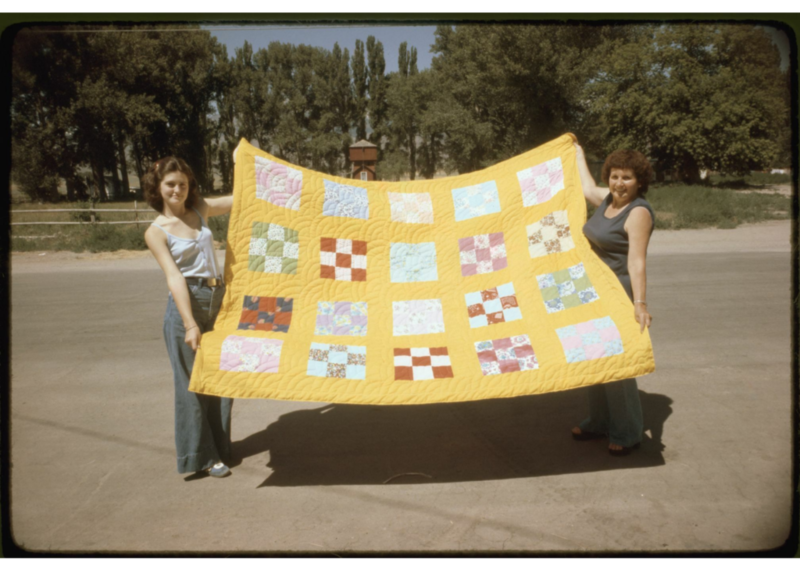 Pictured above with their Nine-Patch quilt are (L-R) Rene Dehaan and granddaughter Jean Dehaan in July, 1978. Photo by Richard E. Ahlborn. Retrieved from the Library of Congress. Have you been quilting or otherwise engaged in the quilt world for more than 30 years? Show me the rounded-edge Kodak prints, the polaroids, the slides — I love it all. If it’s got your personal quilt history in it, I’m interested, and I want you to tell me about the pictures, too: Who are the people? Where were you? What year was it? And what was she thinking with that haircut? Things like that. Here’s an important note: While I’m interested in quilt history from the big bang right on up to five minutes ago, I’m specifically looking for quilt-related photographs of people with their quilts taken from roughly 1940-1990. That 50-year span is where I’m spending major research time for a number of projects. I can comb through this or that archive, and I frequently find things in databases and so forth, but asking you to share pictures is way better because you’re a real-life person who can, you know, talk to me. A citation can’t talk. Besides, I think this is going to be super fun. I have pictures of all the quilts I ever made! When do I start?? Wait, wait! I love that you documented all the quilts you made but I am not looking for pictures of quilts by themselves. I am looking for pictures of people with their quilts. Making them, showing them, sleeping under them, presenting them, hiding under them, waving them like flags, cuddling up in them, helping sew them, using them for oil rags in the garage — all of that, any of that and more. Picture of you and the quilts in your life. That’s what I’m after. The photo up top is the kind of thing I’m talking about. Does this make sense? Got it. Now, reassure me what you’re doing with these. These photos are my property. I want to look at these photos for my own edification and research. If there comes a time when I say, “This photo is incredible and I would like to use it for [insert project here]”, then I will contact you and we will both enjoy filling out many forms. Consider these words our very public, very binding contract: Whatever photos you share with me go no further unless we go further together. Look, it’s possible a hacker could get into my computer and start flinging pictures of you sewing in ’72 with Jan and Marla at the old house on Sycamore Street, but this would be out of my control. I do not think anyone will do this. I’m so excited! I’ve been waiting for years for someone to ask to see my “Krazy Kwiltin’ Daze” photo albums. I have scanned a lot of my photos already. Where do I send the pictures? If there’s a tidal wave of photos (!) there will need to be another system, but for now, scan your pics and email me at mary @ maryfons . com. Attach as many as you like. You can put “Photos” in the subject line. Alternately, you may put in the subject line the kind of ice cream you like best. I’d like to look at an email box full of ice cream flavors, wouldn’t you? I encourage you to use this option. But, but … I don’t have a scanner. Or maybe I do, but I don’t know how to use it. I have so many photos! I hate technology. Now what? What kind of information do you want? I forgot to put the milk away last night, so I hope you don’t expect me to remember names and exact dates on a lot of these pictures. I left the milk out, too. Just do your best. Try to identify the people in the picture. Tell me where the photo was taken. If anything, do try to remember the year, even if it’s a rough guess. But don’t sweat this: I’m not doing genealogical research; this isn’t forensics. Just gimmie the gist. The idea of this makes me happy, but I fear that I will feel sad while I’m doing it. It makes me not want to do it. I know. It’s hard to go through old photos, sometimes. People have passed away. Everyone 25 years ago was 25 years younger. Yes, nostalgia may have its way with you. It always has its way with me. Don’t do anything you don’t want to do. Stick those photos back in the drawer if it’s too weird. I’ll survive! I have this fantasy of sitting and looking at humble photo after humble photo of people and their quilts during this timespan. I’m hoping I’ll see a picture of kids in the ’80s making a quilt fort; I’m prepared to drool over a photo of a sew-in at a college dorm; I’d love a black and white shot of a protest quilt of some kind; I’d just die and go to heaven if one of you sends me a picture with someone smoking while quilting, but this would surely be too good to be true. Whatever you send, whatever you remember, thanks for being there. I’m so sad that it never occurred to me to take pictures of my quilt making process. If smart phones had been around, I think things would have been different. Good luck with your research!!! I learned how to quilt in 1971 in a class called “line, design and color”. That was offered in Appleton Wi. From that class I have quilted many pillows, and baby quilts for my four children. I am 69 now. [ you do the math]In 1980 I took another quilt class for eight weeks to learn how to do different types of blocks and advanced my learning how to quilt. In 2001 I thought i better take a another class to learn about rotary cutters and all the new things that were out there. Since then I have made quilts for my family, charity quilts for children and just make quilts to give to whomever needs one to put a smile on their face. As far as pictures go I dont have any and I dont take any of my quilts because I found people taking pictures of them and tried to copy them for their personal use. I have been ask to write patterns on some but I Won’t. I belong to ASQG and understand the history behind document ion but I don’t want to be known. Hello Mary and Jazzy! Nancy Binder from Rockford IL here. Hope you both had a warm cozy weekend! Mary, I met you at your last class gig in Janesville WI & we talked quilt photos. Not sure if you’re still interested in my collection or not… just thought I’d check in. Take care! Well, I have lots of pictures, both people and quilts. People WITH quilts not so much. I also have the quilts, going back over a century and a half, including 2 that I worked on with my grandma when I was in grade school in the ‘50s. I’m just gonna be the weird one and say it – I love that you’re still rockin’ the chips tag! Yes, I read AAAALLLLL the words, because you’re hella clever with your tags and they often make me laugh. I’ve missed you, welcome back and be good to yourself. We’re here when you are, don’t worry about forcing a schedule. Love this idea, but I bet I don’t have any. Funny thing is my daughter in-law sent a photo yesterday of my granddaughter Lucy, who wanted a quilt with a hood, so I put it in the corner. She chose the ugliest fabric in my stash, so I cut it up small and she uses it often. I can’t seem attach but it is cute. I started quilting in 1974. I can’t count all of the quilts I’ve made. I just finished a quilt top yesterday. Since I’m off today I’m going to finish my bargello top too. I’ll look for pictures. I don’t think I have many. I have found though if I take pictures with my phone I can really see if colors or blocks look good together. No pictures unfortunately but I do have a sad looking pieced pillow that I made in appx 1972 for either a WV history class or 4Hclub. Of course it is not made of reproduction fabrics for history but of 1970’s red and yellow fabric with mushrooms! The only hand pieced “quilt” I ever made and it needs some restoration. When I made this pillow pictures of things were not that common and at that age I definitely did not want too many pictures of my awkward 12 year old self. I am looking forward to seeing your work and the photos of others. Love hearing from you again! This is such a great idea. I wish I had taken pictures years ago of quilts I made and given as gifts. For the past 10 years I have been taking pictures of everything I make, baby quilts, a t-shirt quilt, a skateboard quilt (which I sent a photo to you a few years ago, don’t know if you remember), but you did reply. I’m so happy to open my email and there’s one from you! Hi Mary. I started quilting in 1982. I took two six week classes at Mrs. Wiggs’ Cabbage Patch Quilt Shop in Des Moines Iowa. I was a founding member of the Des Moines Area Quilt Guild. I remembered being completely overwhelmed after going to a Fons and Porter trunk show. I will see what I can find in photoes. My bee ladies (5 of us in a group that once had 50, most gone to meet their Maker) have albums of the quilts we have hand quilted for each other. Next week I will get them to help me go through the pictures. Hopefully there will be some to share! The group, Oreland Quilters, was formed in about 1960 (as far as we youngsters can determine) by members of Christ Lutheran Church, in Oreland, PA.
My grandmother quilted all of her life. My memories of her definitely include quilt scraps (which I was allowed to play with as long as I cleaned up after myself), a colorful quilt in a big hoop draped across her lap while she hand-quilted, her basket beside her chair containing threads and needles, and a bunch of beautiful hardcover quilt books which I would look through and show her all my favorites. I hope I can find a picture of her with one of her quilts (or even me or my sister because we always had quilts on our bed and drug them around the house and played with them) to share with you. If not, I still have a couple of quilts that she made and the memories that we made together! What an amazing idea and you have the audience to carry it off. Hope you will post those retro images. I have absolutely none. I am a recent quilter with not even 5 years under my belt. I was young in 1978 so I’m digging the pants and braless look on the granddaughter! Peace. Yes, I have been attached to the quilting world over 30 years. I started helping my grandmother with her piecing when I was 7. I am 58. Sadly, no. I never took photos in the old days. I do have some newer photos that I don’t mind sharing. Just be kind, I am an amateur. I recently visited the National Quilt Museum in Paducah, Kentucky. Now I know how really bad I am at this activity I love. I have one of my grandmother and me with a quilt that she made for me. I was younger than 10, I think, so it would have been early 1980s? I will dig it out and send your way. She didn’t teach me to quilt, but I’m sure would be thrilled that I’m doing it now! I started quilting in the early eighties. I took a “quilt as you go” class using Georgia Bonesteel’s book Lap Quilting. We made templates and everything was done by hand. Then after a couple of years I did a Trip Around The World quilt using a book that had a template in it by a lady who I believe her first name was Blanche. At the time it was quite revolutionary! It was done in strips . I made a couple of those and was pleased that it was quick to piece. I was still doing the quilting by hand. Skip ahead to the late 90’s and I took my first class using rotary cutter and all done on my sewing machine. I was hooked forever. I am in a group at my church and we do quilts for church members who have lost a loved one. We used the clothes of the departed loved ones. We do other charity things and help one another learn new things . Our biggest accomplishment was when we made quilts for all the veterans in our church. We did 30 quilts and gave them out on the Sunday before Veterans Day that year. It was a very special day with lots of tears and heartbreaking stories. Quilting has created a love between the 14 of us women that is stronger than many others. Recently one of our members lost her husband quite suddenly and we were at the hospital with her holding her up through all of our tears. Our preacher told us he had learned that the bond between us was a force to be reckoned with! We aren’t so good at remembering to take pictures but we have many memories on our beds and in our hearts. I am 85 years old and in a care center now for rehab. Can’t wait to get home and work on UFO s.
My mom and sister are quilters too so I will look through my photos and send some. Is there a time limit? Hello Mary, I sent you a private email with a couple of photos of my treasure. Please let me know what you think. I too will look for photos of me and my quilts. What a fun thing you’re doing! Can’t wait to see all the quilts and people! Want PaperGirl delivered to your inbox? I will never, ever sell your name, ever. I promise.